What should my pre-game warm up consist of? How can I prepare adequately for an important competition? How should you warm-up correctly for a big tournament? What part of my game should I spend most of my time practicing? Can you recommend any practice drills that I could do at my home to work on chipping around the green? 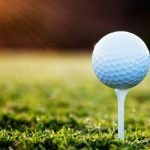 What should my pre-game warm up consist of, before I play a round? Hi! I play around 75 at a very difficult golf club. I will play in the next international junior master in East Aurora, NY next June. I would like to know how can i prepare adequately for this important competition. Thanks. 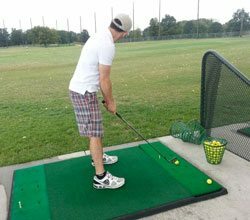 Practice until you are very confident in your ball striking. 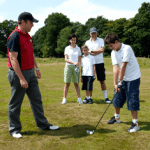 Then as you play practice rounds develop a routine that will allow you to draw on the confidence in your swing and understand that confidence is a choice. The better you get in your routine to hit every shot and tell yourself to trust your method, the more of a choice you are making to be confident in playing the game. How should you warm-up correctly for a big tournament? I often give myself an hour and I practice putting, iron shots, and a couple good drives. Then right before my tee off I get and hit some short putts to get me confident for the day ahead. Is there more I could and should be doing? Thanks for your help! Nicole, What a great question. You are doing a lot of the right things physically to get ready for a tournament from the swing stand point. However, before you swing you should stretch your ligaments and muscles. Most tour pros differ in their exact routine but many of them look like this when written down. 1-1 1/2 hours before tee time, arrive at the golf course. (Use this time to check in and register if that is required for the tournament.) Start at the putting green for 15 – 30 minutes. Move to the range and hit warm ups. Some stretch before the putting green, some before they hit a ball and some warm up after they have hit 15-20 short sand or pitching wedge shots. They finish warm up in 20-40 minutes. They finish with some bunker shots and some return to the putting green for a final few putts, most don’t. You also must prepare mentally. Before you ever get to tournament day and/or to the tournament site, you want to have already set a game plan in your head and/or preferably in writing. 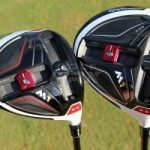 Your game lan should be what clubs you want to hit where off the tees, what strategy you want to use and play the whole round in your head before you get to the site. If you tend to get nervous (we all do) hen find something to help you relax, such as deep breaths, closing your eyes and imagine clouds and peaceful days, etc. As you warm up, have specific targets and rehearse your routine for hitting shots on the course. There are some great books of instruction that talk about how to practice and how to prepare to play such as Ben Hogan’s “Five Lessons, the Modern Fundamentals of Golf” and Jack Nicklaus’ “Golf My Way.” If I recall correctly, these are a couple that has some info on preparation. 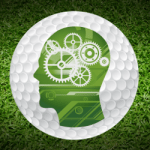 There are also tapes and/or books by Dr. Bob Rotella, Dr. David Coop, and Dr. Richard Coop who are all famous Sports Psychologists that can help with the mental side of preparation and playing. What part of my game should I spend most of my time practicing. 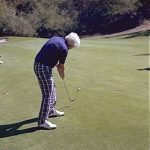 The most important part of your game to practice now and for the rest of your life is your short game. Putting, chipping and pitching from 60 yards and closer account for about 60% of scoring from beginner to Tour professional. Sharpen your short game. It is where your scores will drop the fastest. As you get bigger and stronger you will benefit greatly and quickly. Mr. Robbins I’m currently not playing that much because of the cold weather in Kentucky. Could you recommend any practice drills that I could do at my home to work on chipping around the green? Thanks for your advice. You are working on the right things for the cold weather. I guess the best way I can put it on practice on chipping is to say “become Ben Hogan.” While on Tour, Ben Hogan would practice chipping in the hotel room by placing the pillows from the bed against the wall and chipping balls into the pillows. Work therefore on being sure your chipping stroke is short, compact and precise. Concentrate on consistent ball contact (use electrical tape on the club face to check impact points) and feel. If you have a hallway to chip in then I suggest you practice with different clubs to see the different trajectories from your wedge, 9, 8, 7,6 and 5 irons and watch the difference in the rolls. Take advantage of the good weather days to go to a golf course and try out your new skills and see how the ball reacts on the green. To become a great chipper, you want to learn to control the trajectory of your chips. Work hard this winter. It will show up real quick in your scores in the Spring.